Tigex Teether Ring | Multicolour | Gently stimulates amd massages your baby tender gums. 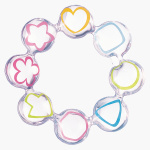 An appealing pick for your little angel, this teether ring with its attractive design is a must-have. Boasting of a soft and safe make, the ring is ideal to massage your baby's gentle gums while biting it.